This is the story of a little oil spill that changed everything. It all began nearly fifty years ago, on the foggy Tuesday evening on Sept 15, 1969, when a tugboat pulling a barge filled with light fuel oil, bound for a power plant on the Cape Code Canal, experienced a catastrophic series of mechanical problems. First the radar failed, then the rudder stopped responding, and finally the tug’s towline broke, sending the Florida oil barge adrift until it ran aground on an underwater shoal near West Falmouth, Massachusetts. 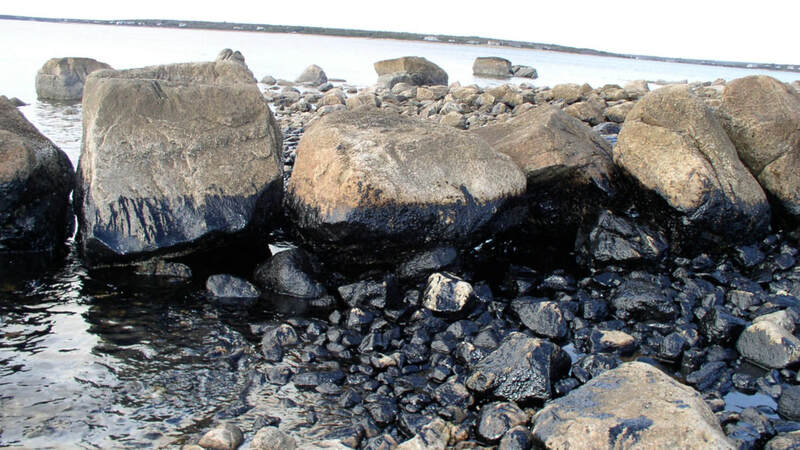 The rocks ripped into the hull, spewing nearly 175,000 gallons of Number 2 fuel oil into Buzzards Bay. Just after midnight, John French, a local resident, called the Coast Guard after being awakened by the stench of oil wafting into his house from the bay. By mid-morning strong winds had spread a thick coffee-colored oily mixture across miles of beaches and coastline, littering one of New England’s most popular tourist attractions with dead and dying marine creatures, including countless scallops, lobsters, and marine worms. Dead marine animals washed up on shore following the Florida Oil Spill in 1969. Photo by George Hampson. © Woods Hole Oceanographic Institution. 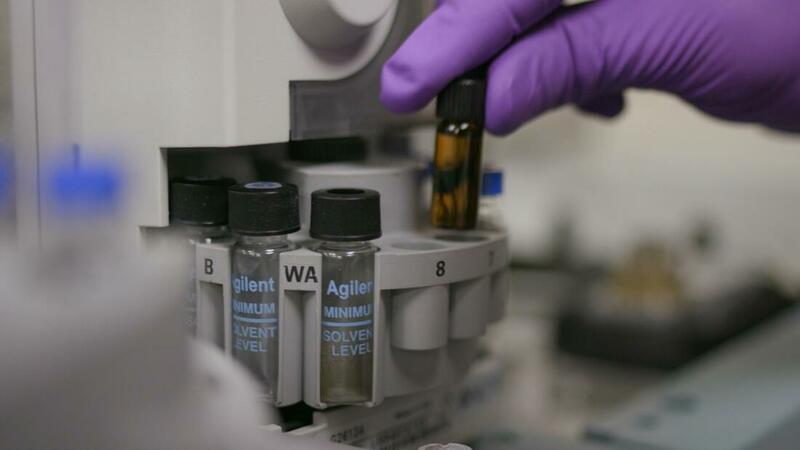 ​“Some folks called it ‘silent autumn,’ because there was so much death and destruction from the diesel fuel,” says Dr. Christopher Reddy, a senior scientist in the department of Marine Chemistry and Geochemistry at Woods Hole Oceanographic Institution. While a fairly small spill by most standards, says Dr. Reddy, it triggered one of the longest running oil spill research projects ever conducted. The Florida spill also forever changing how we study marine oil spills as well as our understanding of oil’s long-term impact on sensitive ecosystems like salt marshes. Coast Guard Officers communicate by megaphone with the Florida barge after it ran aground off Cape Cod in 1969, spilling 189,000 gallons of oil. © Woods Hole Oceanographic Institution. 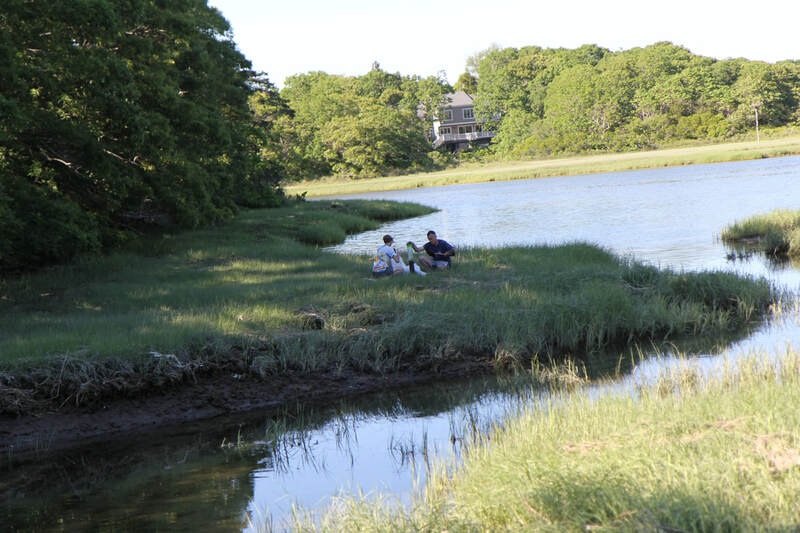 ​In the summer of 2018, Marine Defenders joined Dr. Reddy and Samuel McNichol, an undergraduate intern, on a research expedition to a salt marsh along the Wild Harbor River, a lovely oasis of green about a mile inland from Buzzards Bay, which is ground-zero for the study of the persistence of marine oil spills. “The conventional wisdom by the industry at the time of the Florida spill was that the oil would only last two weeks,” explains Dr. Reddy, dressed in shorts and a blue tee-shirt as he searches out an area of the marsh that has come to be known as M-1 (marsh sample 1). Dr. Reddy’s field kit includes a long plastic tube, which, after getting his bearings, he proceeded to pound into the marsh using a heavy mallet. When the tube is extracted, after a fair amount of digging and manual exertion, it contains a long plug of grass, roots and fibers cut from heart of the marsh. 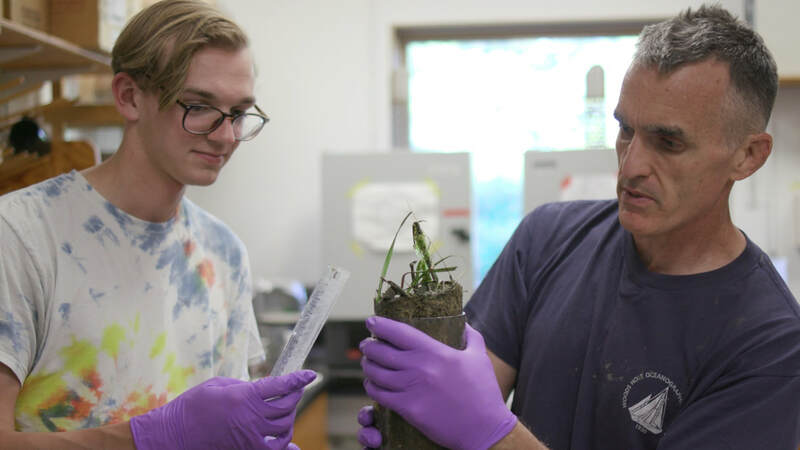 “A sediment core is like a tape recorder, or a tree-ring,” he explains, which will reveal the marsh’s hidden history when analyzed back at his laboratory at Woods Hole. ​Dr. Reddy is literally following in the foot-steps of a marine biologist named George Hampson, who was doing research at Woods Hole in 1969, when he received a phone call from a friend saying that fish and marine invertebrates had begun washing up dead along the shore line. Curious, Hampson invited his colleague, Howard Sanders, a specialist in benthic, or bottom-dwelling, marine life, to try to figure out what was happening. 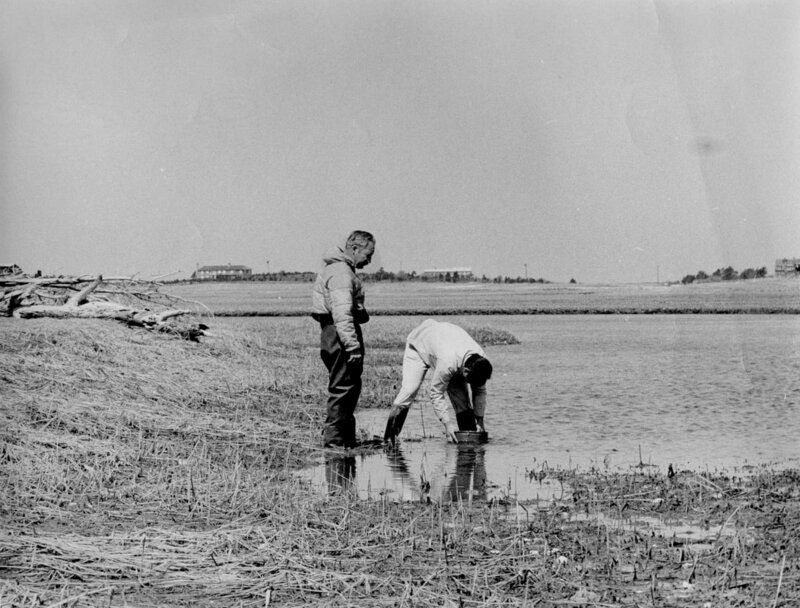 George Hampson and Howard Sanders collecting samples after the Florida Oil Spill in 1969. © Woods Hole Oceanographic Institution. ​Toxins in the oil from the Florida barge, they concluded after collecting samples in the bay and shorelines around West Falmouth, were ripping apart the local marine ecosystem. And it wasn’t just marine life in the bay that was affected. Hampson and Sanders also took samples along the Wild Harbor River, a small tidal estuary close to Woods Hole, where the wind and waves had pushed large amounts of oil upstream, inundating the salt marsh along its shores. Wild Harbor River with oil following the Florida barge oil spill in 1969. © Woods Hole Oceanographic Institution. Further research showed that while the oil had seemingly disappeared from the water and beaches along the bay, a thick band of oil had been absorbed into the fabric of the salt mash, and would remained in the sediment at least a decade after the spill. These discoveries have shaped how spill responses take place around the world. “Today, when folks are sitting at an oil spill headquarters, and they only have so much boom, and so much time, they ask, what can we protect in the time that we have?" ​Sanders and Hampson also drew in Max Blumer, a world class geochemist and petroleum specialist at Woods Hole. He agreed to carry out a detailed chemical analysis of their samples, which he compared with a sample of the fuel oil from the Florida barge. 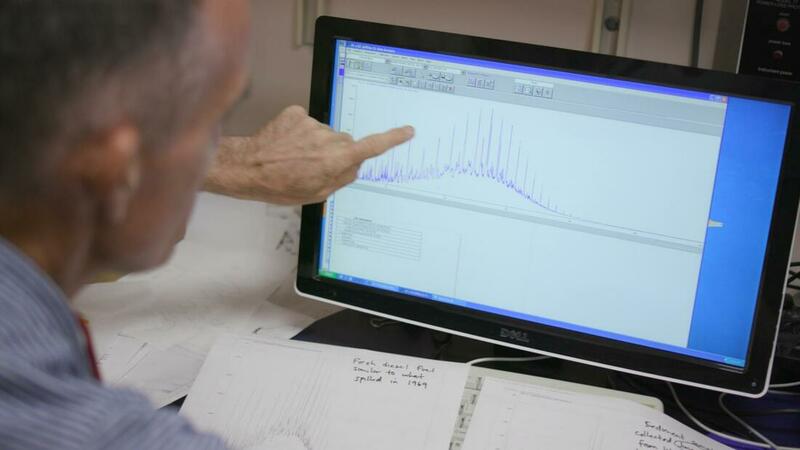 Using a gas chromatograph, a fairly new instrument at the time, Blumer was able to graph the chemical composition of each sample, producing what he called a biological “fingerprint” of the oil. “Any patch of crude oil has fingerprints in its composition,” Blumer later explained, making it possible to trace any sample back to its source. Comparing the field samples with the sample of oil from the Florida, Blumer found a clear match. “The samples from the marsh and offshore showed very clearly the profile of the spilled oil, which was to become so familiar to us,” he explained. His high tech detective work would later prove its value when the owners of the barge tried to dispute that the Florida spill had caused any particular environmental impacts. 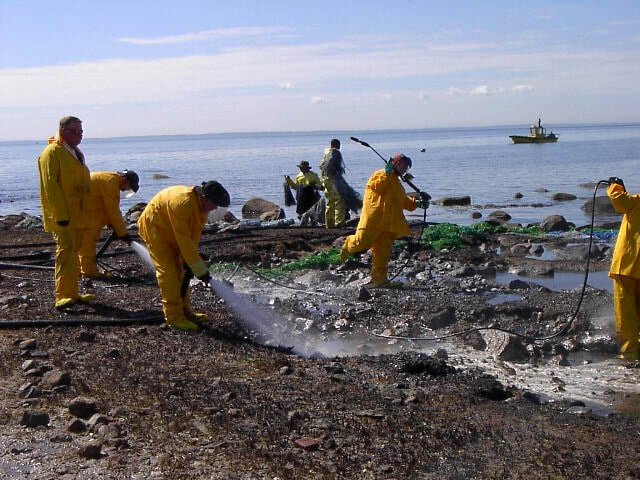 The team’s findings would also shape enforcement of the US Oil Pollution Act of 1990, which requires polluters to clean up and return any ecosystem to its pre-spill status. ​Biologist Howard Sanders also documented the sublethal effects of the Florida oil spill on wildlife living in the salt marshes of Wild Harbor in 1969. 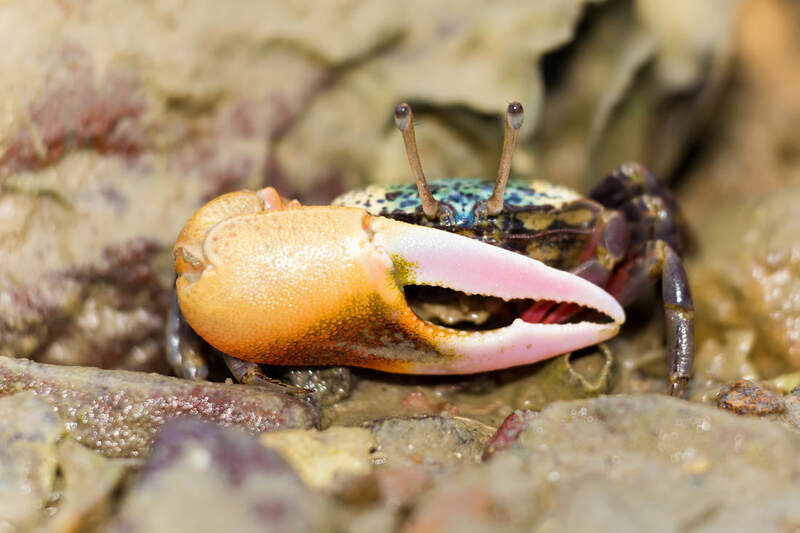 He found that fiddler crabs became slow and disoriented after being exposed to the oil, making them vulnerable to predators. He also observed that the layer of oil deposited in the salt marsh was causing the crabs to dig shallower borrows, resulting in many being swept away by the winter tides. These results were later replicated in a study by Jennifer Culbertson, a graduate student at Boston University in 2007. 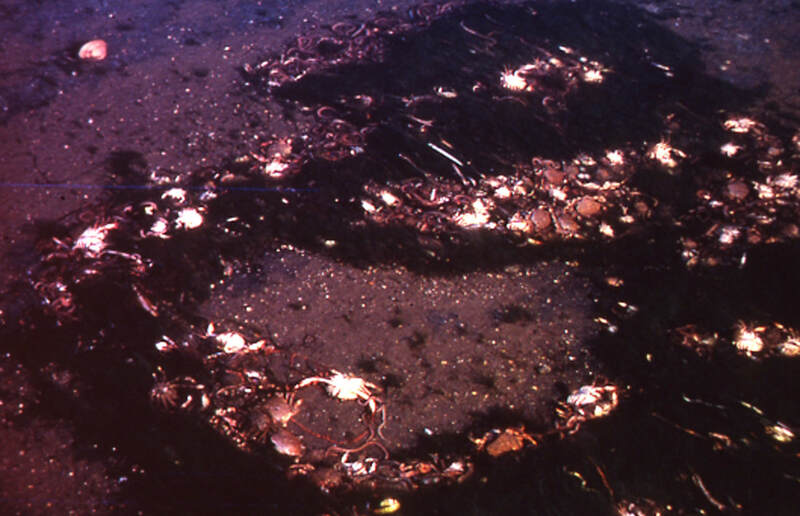 Her research also showed that the crabs did not burrow as deeply in the areas still impacted by oil as they do in oil-free areas in Wild Harbor. She found fewer crabs in the oiled areas of the marsh, and those she did find moved more slowly than crabs living in an oil free environment, making it easier for predators to catch them, thus passing the toxins in the oil up the local food chain. Four decades later, Culbertson concluded, the Florida spill was still wreaking havoc on Wild Harbor’s salt marsh ecosystem. Back at his laboratory at Woods Hole, Dr. Reddy balances the tube with core sample from the Wild River salt marsh on a round platform. With Sam’s help, he carefully exposes the marsh grasses and begins to cut a series of two-centimeter slices from the core using a serrated bread knife. Each slice is carefully wrapped in tin foil and labeled, and as they work their way down to the bottom of the core, the sharp smell of diesel oil filling the laboratory. It’s not entirely surprising, says Dr. Reddy, who first struck oil when collecting samples from salt marsh nearly two decades ago. This discovery of oil, Dr. Reddy says, actually changed the focus of his work – and led him to spend the next two decades studying oil spills. 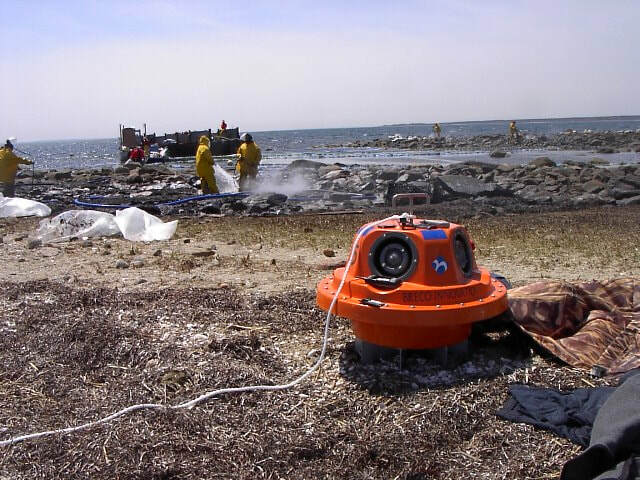 It all began in 2000, when Aubrey Hounshell, an undergraduate at the University of Hawaii called Dr Reddy asking to spend the summer studying oil spills at his lab at Woods Hole. “I told him I can’t call up Exxon and tell them to dump oil,” he recalls, but then chemist John Farrington, one of his mentors at Woods Hole, suggested updating Blumer’s research on the Florida oil spill’s impacts on the Wild River salt marsh. Why oil persists in the environment continues to fascinate Dr. Reddy. “What we're basically doing is monitoring how that oil at Wild Harbor has changed through time,” says Dr. Reddy, while he places a sample from the marsh core into the chamber of a high tech version of Max Blumer’s original gas chromatograph. The results, when they appear on a computer screen, reveal a bell-curved shape curve showing the biological components of the oil from the salt marsh sample. 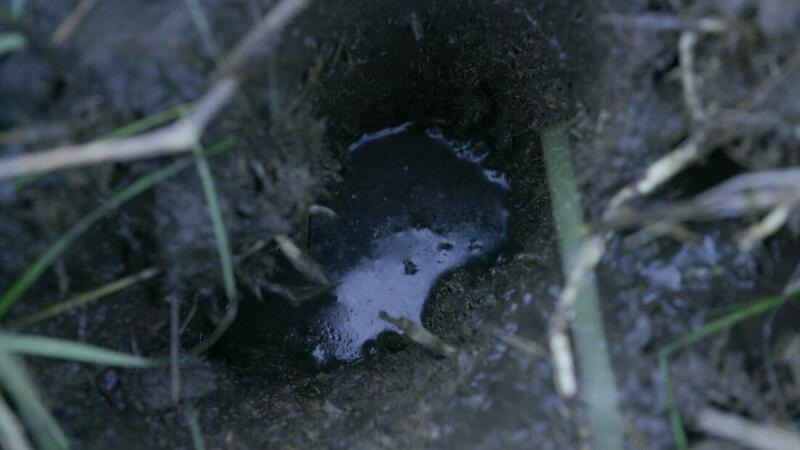 This is evidence that not only is the oil still presen, but that the oil hasn't broken down in the environment. The results show that the sample is remarkably similar to the oil samples that Max Blumer originally studied in 1969. “Nature has hit a roadblock,” Dr. Reddy says. This is important because many oil spill cleanup plans still rely on a tactic known in the industry as “natural attenuation,” which relies on naturally occurring microbes to clean up the spill by eating the hydrocarbons in the oil. It’s cheaper than physically cleaning up a spill, and favored by industry, but results like these suggest it’s a tactic that may not always work, depending on the location of the spill. “While nature certainly has helped the marsh heal a little," Dr. Reddy says, "this is a chronic problem where nature is incapable of healing itself." Max Blumer and his colleagues estimated that four tons of oil remained in Wild Harbor eight months after the spill in May 1970. Emily Peacock, a researcher at Woods Hole, spent two years carrying out a study exploring how much oil remained. She took core samples from 26 locations along the west and east side of the salt marsh. "Only a small amount of oil exists in a small area but at high concentrations," she wrote in September 2005 report, estimating that about 100 kilograms of oil remained in the marsh. ​"Wild Harbor marsh continues to store petroleum residues 30 years after the Florida spill," she concluded. "The locations that were most heavily contaminated continued to have the most persistent residues." Emily Peacock found "only 0.01% of the oil that was initially spilled persists," notes Dr. Reddy. "Yes, oil is there. Yes, it still affects the ecosystem, but its in a very very localized location." "In the short term, it was catastrophic and the marsh hurt for a few years," he adds. "Now its is post-card pretty and thriving. You could argue it's a victory that the area recovered so well." 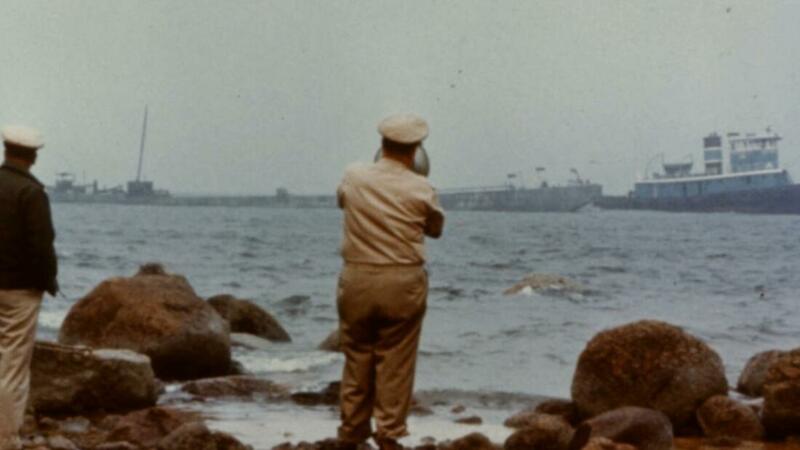 A Silent Fall: The Story of the West Falmouth Oil Spill by E. Graham Ward. The West Falmouth Oil Spill: Persistence of the Pollution Eight Months After the Accident Woods Hole Oceanographic Institute, Sept 1970, unpublished technical report. By M. Blumer, J. Sass, G. Souza, H.L. Sanders, J.F. Grassle, and G. R. Hampson. 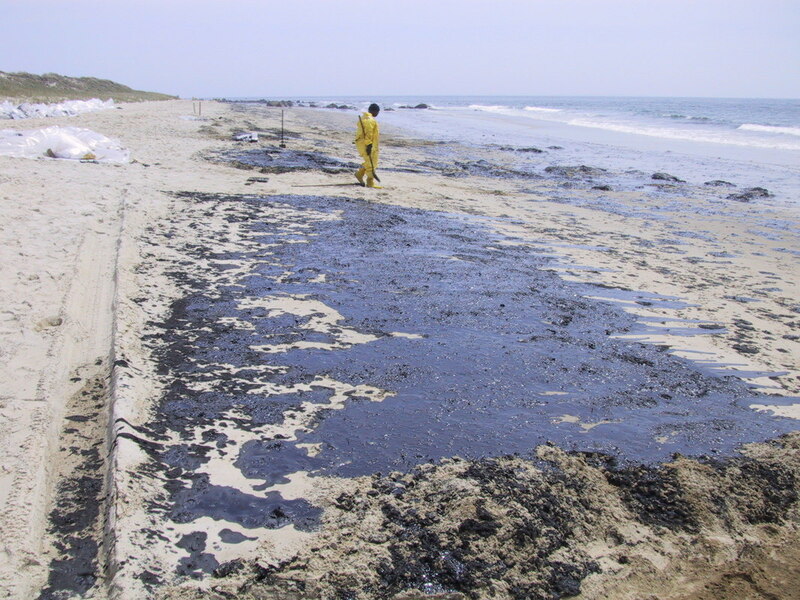 A Small Oil Spill at West Falmouth, US EPA Decision Series, Edited by Francine Sakin Jacoff, Text by Howard Sanders and others. 1979. Still Toxic After All These Years, Oceanus Magazine, April 23, 2007. By Christopher M. Reddy. A Magnetic SpongE for oil spills? We’re kicking off 2019 with an optimistic report from Canada. Researchers at the University of Calgary have developed a “magnetic sponge” that can be used to clean up oil spills. The sponge is made of magnetic nanostructured white graphene, which, according to a report in The Maritime Executive, is biodegradable and can absorb crude oil up to 53 times its own weight. When placed in water, this new material repels water and soaks up the oil. A magnet held close to the surface of the water is able to attract the oil-soaked sponge and lift it -- and the oil it has trapped -- out of the water. Oil can also be wrung out of the reusable material, making recovery of the spilled oil possible for the industry. 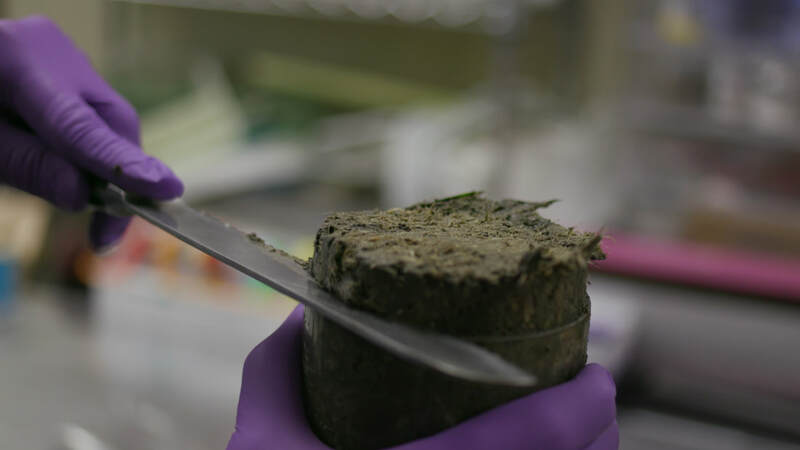 The team in Calgary is not the first to consider magnetic nanomaterials for oil spill cleanups, but previous attempts used materials that posed human health risks. The white grapheme-based material, researchers say, is both biodegradable and safe. "We are always trying to go beyond the lab and try to have more real solutions to what the industry is facing today," Nassar recently told the Canadian Broadcasting Service. The next step involves testing the "super sponge" on a larger scale, he says. Chemical dispersants currently used to cleanup oil spills can cause nearly as much harm as the oil itself, so its exciting that Dr. Nassar and other scientists continue to look for alternative ways to clean up oil spills, and leave the marine environment intact. A happy start to the new year, indeed! A major oil spill off the coast of Newfoundland, Canada, is proving challenging for biologists trying to assess the damage caused to wildlife. On November 16, Husky Energy’s SeaRose off-shore oil platform, located about 350 kilometres from St. John’s in the White Rose oilfield, dumped an estimated 250,000 liters of oil into the sea off the coast of Newfoundland and Labrador. The SeaRose was attempting to restart oil production during a fierce storm that was, at the time, the most intense in the world. Husky was the only producer that attempted to restart production during the storm, according to a Global News report. In this underwater oil field, wells are drilled by a mobile drilling unit and connected to the SeaRose through a network of flow lines. The spill was the result of a damaged underwater connection between the oil platform and the oil tanker. It is the largest spill every reported in Newfoundland and it happened at a particularly dangerous time for migrating sea birds. 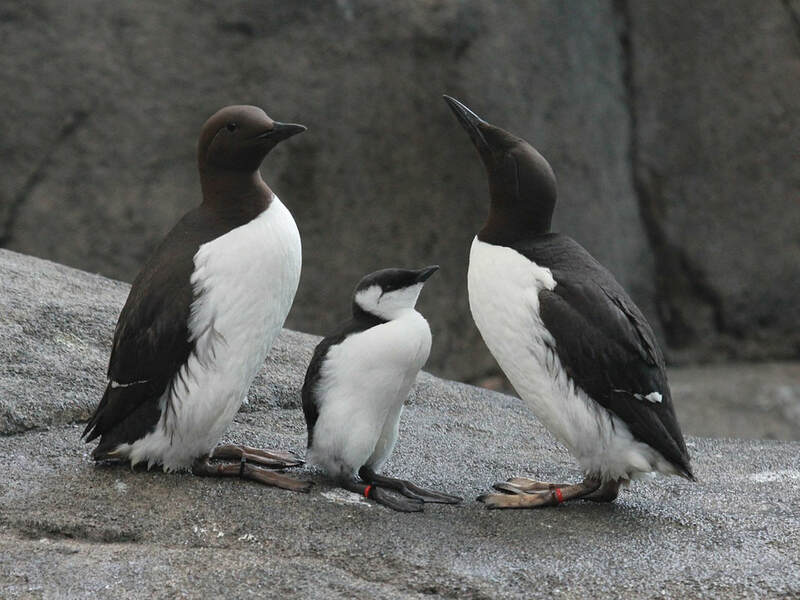 Arctic seabirds such as murres and dovekies migrate south and spend their winters off the shotes of Newfoundland. The birds are extremely vulnerable to the cold, in part because oil damages the natural insulation provided by the bird's feathers. When oil disrupts the birds' feathers, it leaves them vulnerable to hypothermia. Wild life biologists working to determine the extent of the damage to wildlife are aware that a much smaller spill from the Terra Nova in 2004, also off the coast of Newfoundland, killed 10,000 seabirds. Some estimates put the number as high as 100,000. The company that operates SeaRose has only reported 11 oiled birds so far, but Fraser fears the impact may be much higher, since the birds live far off shore, and likely will not wash up on any local beaches. "We’re not going to see dead birds on land," Fraser told the Guardian. "There’s no graphic images to grab the public to help them realize how important the impact of this spill could be." Newfoundland's natural resources minister, Siobhan Coady, was critical of the oil company's decision to begin production while the waters in the area were still rough after the storm. “If they did everything according to protocol, then we need to change the protocol,” she said. Near the eastern edge of the Buzzards Bay, Massachusetts, about half a mile off shore, lies Ram Island, a tiny two-acre speck of rock and sand that serves as a spring nursery for roseate terns, one of the most elegant and endangered seabirds in the Eastern United States. The island's highest point rises just nine feet above the salty waves, and as Carolyn Mostello, a veteran seabird biologist with MassWildlife, approaches in a small motor boat, a swirling cacophony of roseate and common terns, small white birds with black caps and forked tails, rises up to defend their shared nesting ground. An adult roseate tern landing near a nesting box on Ram Island. 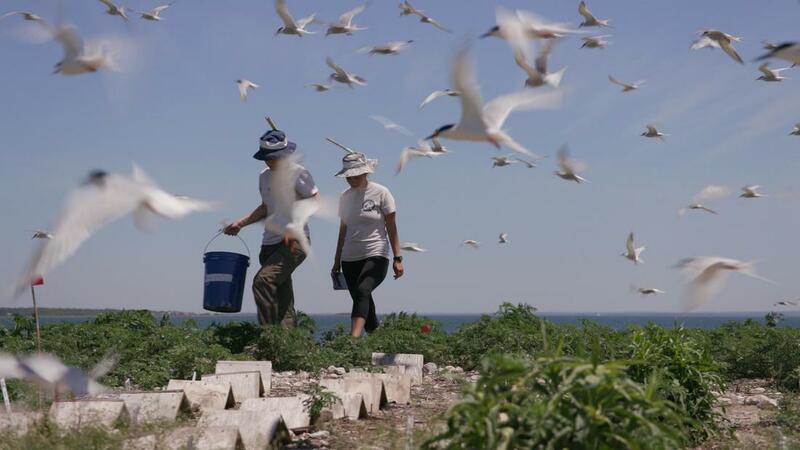 ​“Ram Island has about 1,100 pairs of roseate terns that nest on it each year,” says Mostello, who leads the Massachusetts Division of Fisheries & Wildlife’s Buzzard Bay Tern Restoration Project. 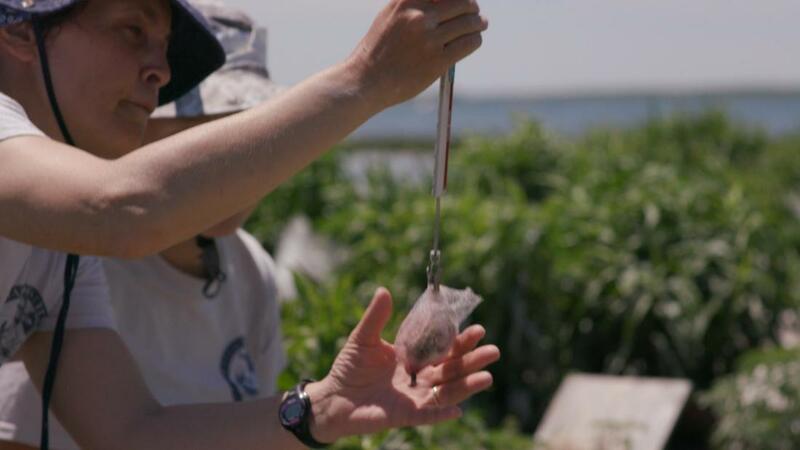 "This represents about 25 to 30 percent of the total breeding population in the United States," Mostello explains, as she puts on a weathered guano-stained floppy blue hat with a foot-long stick taped to the top before landing on the island. "The theory is that the terns will peck at the stick, instead of your head, hands and face," she says, "but it doesn’t always work." A common tern, which often nests alongside the roseate terns, carrying a small fish back to its nest on Ram Island. The island’s small size, she says, and the absence of trees or houses where predators can perch, combined with close proximity to waters rich with American Sand Lance, a small fish favored by the terns, makes it an idea nesting site for both roseate and common terns, which tend to nest alongside each other. While the two species look similar, the roseates have longer tails, sport at light pink coloring on their breasts during the summer season, and their beaks are mostly black during the breeding season, while the common terns are slightly larger and sport an orange bill with a black tip. ​“Terns, like most seabirds, nest directly on the ground,” Mostello says, pointing out speckled two small sand colored speckled eggs blending into island's rocky ground. 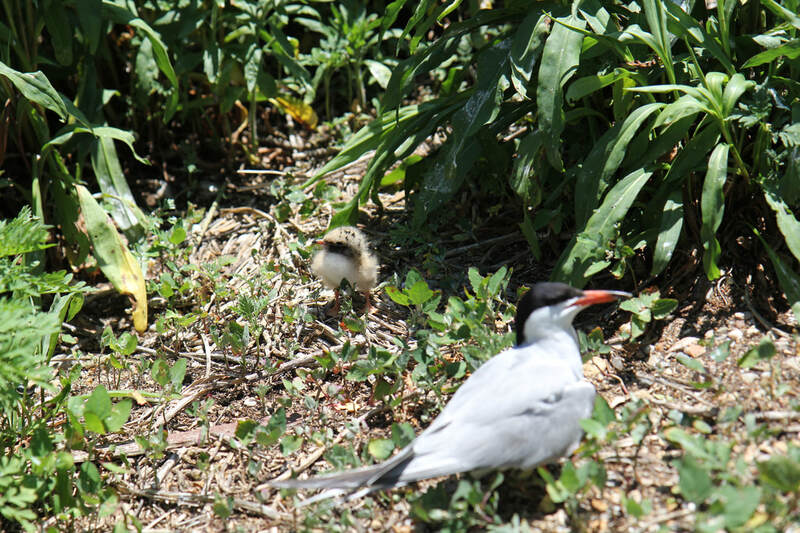 Common terns tend to nest in the open, while roseate terns prefer to nest under vegetation or simple wooden shelters provided by their human caretakers, which is why unescorted visitors are not allowed on the island during breeding season. 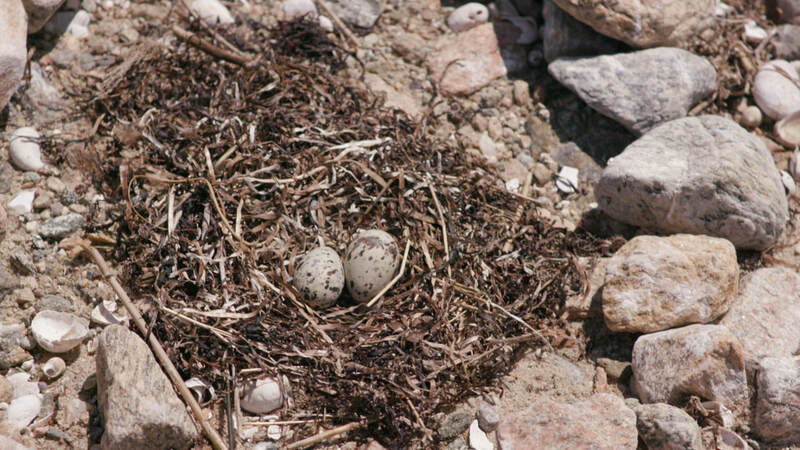 Terns lay their speckled sand colored eggs in nests directly on the open ground, placing them at risk from predators and careless human visitors. Roseate terns were a popular source of hat feathers in the 19th and early 20th centuries, which caused the population to declined very sharply. The commercial trade in their feathers was eventually banned and the population rebounded. Their numbers declined again in the 1970s as gulls began to expanded their range northward, taking over many of the terns coastal nesting sites. By 1978, only 2,500 breeding pairs remained. 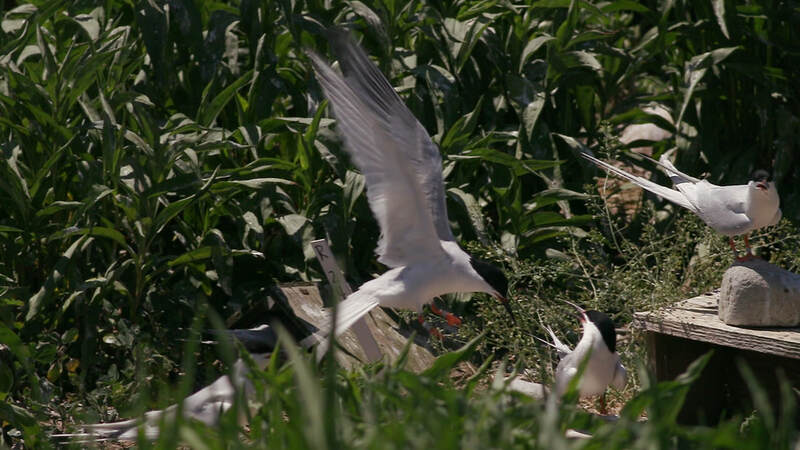 Today, as a result of intensive management of the species and nesting grounds by scientists like Carolyn Mostello, the roseate tern has increased to nearly 4,000 breeding pairs. “These aren’t populations that are self-sustaining," she explains. ​“If we weren’t out here working every summer and didn’t intensively manage the island, you would again see the population decline very quickly." The problem, she says, is there are only three breeding colonies left in North America, and all are located on small low-lying islands along the North Eastern coastline. This makes these breeding grounds vulnerable to long list of potential threats, including careless human visitors, dogs, rising sea levels as a result of climate change, destructive storms, and oil spilled into the water, either intentionally by commercial vessels looking to dispose of used oil and oily waste, or as a result of industrial accidents, both of which happen far more frequently than you might imagine. Common tern and chick. Photo by Lucas Fink. 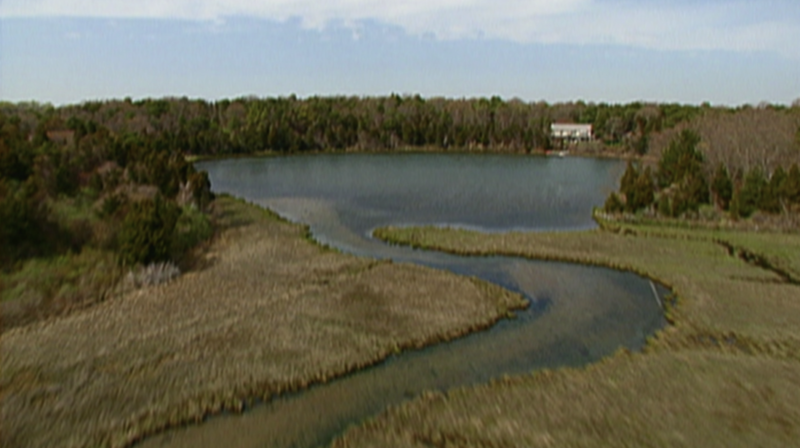 Buzzards Bay is about 8 miles wide, 28 miles long, and is a popular destination for fishing, boating, and tourism. It also serves as a major transit route for tankers and barges transporting oil and gasoline to Boston and northern New England, with nearly 2 billion gallons of oil passing through Buzzard’s Bay in 2017. More than a dozen major marine oil spills have occurred over the last sixty years, including one that took place on Sunday, April 27, 2003, just as the terns were arriving on Ram Island to mate and nest. That’s when the Bouchard 120, a squat red oil tanker passed on the wrong side of a navigational marker and hit an underwater shoal, ripping a 12-foot long tear in its hull, spilling 98,000 gallons of No. 6 bunker fuel into the bay. 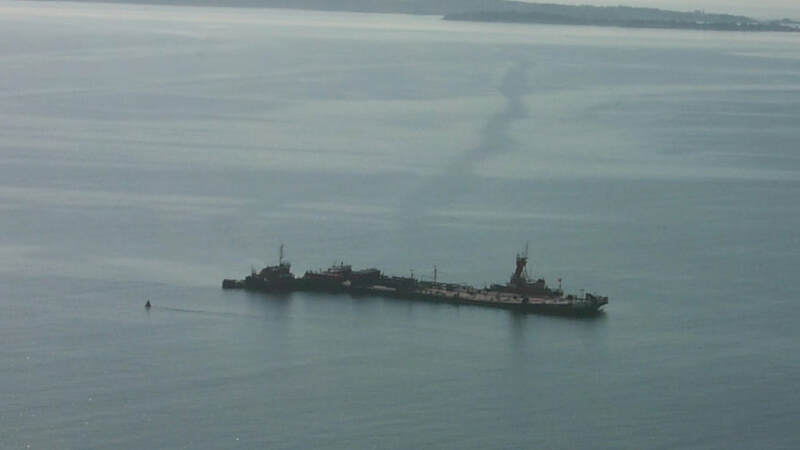 The Bouchard Oil Barge #120 leaking oil into Buzzards Bay after striking a rock. 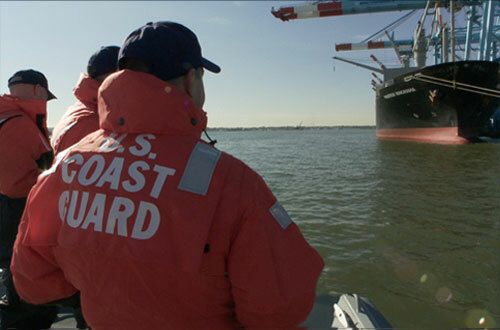 Photo courtesy of the US Coast Guard. An oiled tern found on Ram Island. Photo by Carolyn Mostello. ​“It was very sad,” she says. 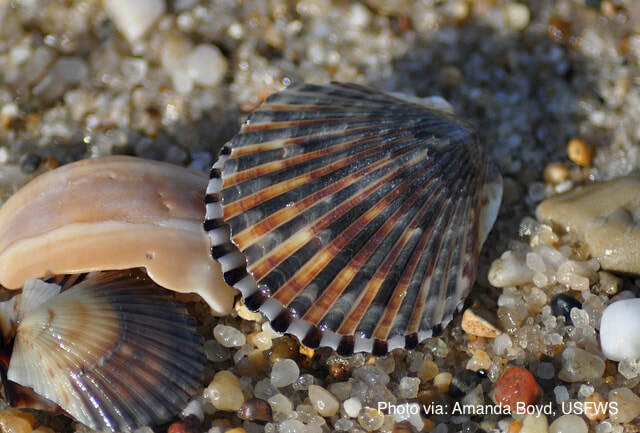 Nearly 100 miles of shoreline in both Massachusetts and Rhode Island were eventually coated with oil, forcing the closure of beaches and shellfish beds along the Bay. Seabirds spend a lot of time coating their feathers with a thick, waxy substance produced by a gland at the base of their tail, which protects their skin from direct contact with water. Oil can damage or destroy this layer of waterproofing with often lethal results. Mostello was faced with a singular challenge. 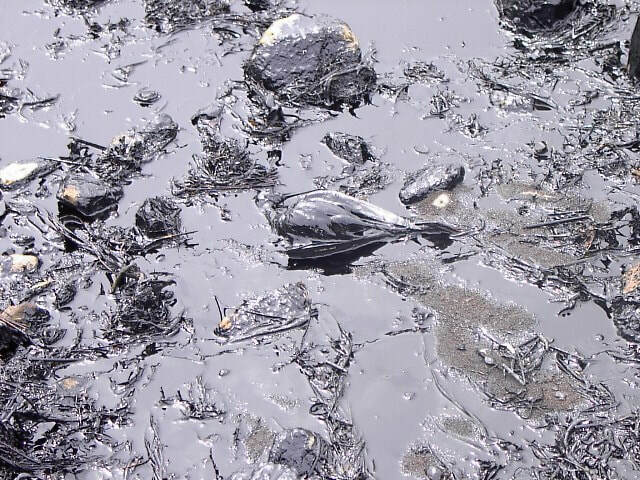 ​How could she keep the nesting birds from further contact with the deadly oil? The following weeks were a nightmare of frenzied activity for Mostello, who helped organize the clean up of the island. About 2,000 terns were already roosting on Ram Island, and she feared that extended contact with the thick sticky oil could decimate the entire nesting population. There was only one solution. They had to convince the birds to leave and delay their nesting until the island could be completely cleared of oil. “Hazing is something we would never, under normal circumstances, never do,” Mostello says. But this situation was far from normal. Sound cannons were used to scare the birds off the island while the oil was being removed. Photo by Carolyn Mostello. ​She set up a battery of sound cannons on the island to scare the sensitive birds away during the day, and “at night we would go out with flashlight and shine lights on them,” she recalls. “The terns are very skittish at night. That would keep them off the island at night. But they would come back during the day and some of them actually nested next to the cannons while they were still firing, so it wasn’t 100 percent effective." Eventually, many of the terns moved to two other small islands in Buzzards Bay to nest. "This is why it’s so important to have multiple islands available for nesting in case of a catastrophe," which is now part of the long term conservation strategy for Buzzards Bay. Workers scrub rock with power washers and pick up contaminated materials to protect the nesting birds from contact with oil. Photo by Carolyn Mostello. ​The clean up was originally estimated to take one week, but it took a 40 person crew nearly four weeks to clear all the oil from the island. The stress of the clean up, and the removal of all the oiled seaweed, plants and marsh grasses, damaged the islands ecosystem, Mostello says, and a salt marsh at the north end of the island never fully recovered. On May 30, 2013, nearly a month after the spill, the terns were allowed to return. The U.S. Fish and Wildlife Service later estimated that at least three adult roseate terns were killed by the oil and 350 chicks were lost because of the delayed nesting, which cut the annual production of chicks by roughly ten percent. Oiled beach on Buzzards Bay. Photo courtesy of Buzzards Bay Coalition. The official clean up, recovery, assessment and compensation for the environmental damages caused by the 2003 spill is still unfolding today. In the weeks after the spill, volunteers and clean up crews found the bodies of 315 birds from 34 different species, including common and roseate terns, cormorants, willets, dunlin, great yellow legs, mute swans, common loons, and piping plovers along nearly 100 miles of coastline reaching from Massachusetts to Rhode Island. Migrating birds were also exposed to the oil, and two oiled loons were found in New Hampshire. Estimating the total effect on the roseate terns is complicated, Mostello says. “There is definitely an impact on the next generation, there are fewer birds in the next generation, and those birds killed during the spill are not able to available to produce chicks into the future." Bouchard, the company which owned and operated the barge, agreed in 2004 to pay a $10 million dollar fine for violating the Clean Water Act and the Migratory Bird Treaty Act. The company also settled a class action lawsuit for $11.45 million filed by 700 private property owners on Buzzards Bay. The company was also liable for the costs of the cleanup and restoration of natural resources in accordance with the Oil Pollution Act of 1990, and paid out $6 million for injuries to shoreline and aquatic resources in 2010, and an additional $13 million to compensate for additional injuries to loons, sea ducks and other migratory birds and their habitat in 2017. Some of these funds, once the settlement is approved by the courts, may be used to help defend the low-lying nesting grounds on Ram Island from flooding and erosion taking place because of rising sea levels, which represents the newest threat to the species long term survival. “We just completed a big project to raise the altitude of Bird Island, another roseate tern nesting site a few miles up the Bay, to counteract the effect of sea level rise related to climate change,” says Mostello. Carolyn Mostello, a wild bird biologist, and intern Isabel Crane, doing research on Ram Island. 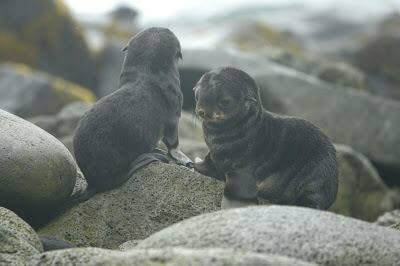 By mid-June, the breeding season is already well advanced. “We got a range of chick ages on the island now,” Mostello says while lifting up the roof of a small plywood breeding box, revealing two plump young roseate tern chicks about a week-and-a-half old. “Once they hatch it takes about three weeks for the chicks to fledge, Mostello explains. “So for the next few weeks we’ll still have chicks out here that are growing and being fed by adults, before they are ready to take off and start migration.” Once the young chicks are able to fly, they will move north in small family groups to the tip of Cape Cod to feed and prepare themselves to migrate to their winter feeding grounds in South America. Carolyn Mostello weighs a roseate tern chicks to monitoring the health of the nesting colony. 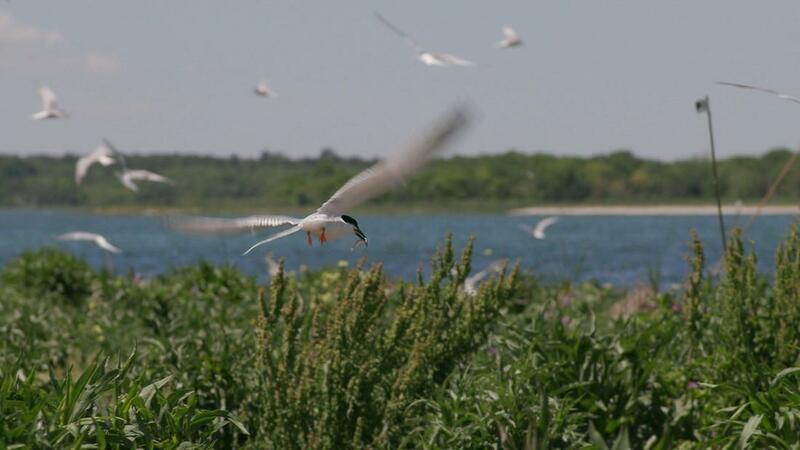 ​The number of roseate terns in Buzzards Bay has increased by thirty-seven percent over the last eight years and Mostello is hopeful this trend will continue. “We've still got plenty of eggs that haven’t hatched but this seems to be a pretty good year for chicks,” she says, while weighing and banding a series of fluffy young birds. 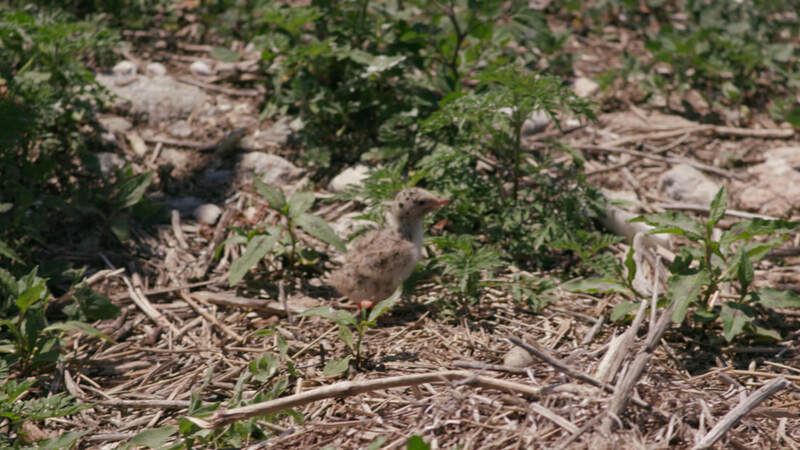 A two week old common tern chick on Ram Island.